1963. Stayed here while pestering the Scandanavian Seamen's Union for a job on a ship to anywhere. Took the Muni to the Ferry Building every day. See Evanger. About Room 28: There was a tiny door to a tiny bathroom with no windows. On the other side of the tiny bathroom was another tiny door and behind that other door, it turned out, was a pretty girl, also looking for work. Having grown up in a house full of brothers, this was a first for me. Cool! 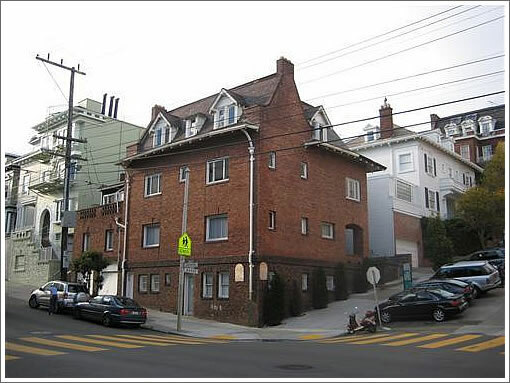 Built as a single-family home in 1904, converted to a boarding house known as "Baker Acres" in the 1940’s, and then Ellis Acted in 2002, an almost fully gutted and foreclosed upon 2201 Baker Street went on the market in November of 2007 asking $2,490,000. Purchased for $2,538,000 and completely rebuilt as a single-family home by RBR Development (think Regina Callan), 2201 Baker Street is about to return to the market as the first "eco-friendly" Metropolitan Home Modern by Design Showhome. This 7,700 square foot home, is outfitted with the latest green technologies [Regrid solar photovoltaic panels], building materials [high efficiency insulation, low u-value glazing, low VOC paints, recycled brick], mechanical systems [two high efficiency furnaces with air purification system]...and spectacular cutting-edge modern design on 4-levels of impressive living space and outdoor spaces including a large walk-out garden and roof garden to accommodate the lifestyle of a modern San Francisco family. As a plugged-in eddy correctly surmised (and stole a bit of our thunder), Barbabra and Robert Callan have the listing with a whisper price of $7.1 million. The first VIP tours are scheduled to start in a week with a month of public tours starting on June 20th ($25 tickets benefit the San Francisco Ballet).